Russian-terrorist troops in Donbas continue actively using artillery and heavy armaments to shell the positions of Ukrainian troops as well as settlements, including those controlled by the terrorists themselves. 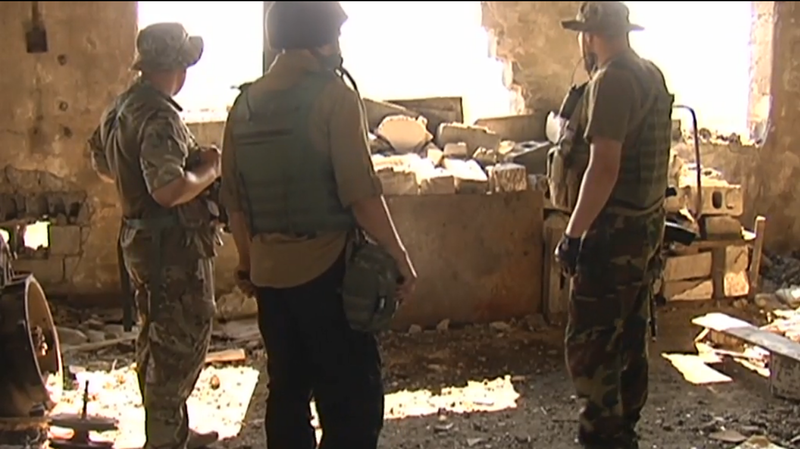 The situation continues to be the most tense in the Donetsk sector. Terrorist fire is virtually uninterrupted on the stretch spanning Krasnohorivka – thenorth-west outskirts of Horlivka – Pisky – the northern outskirts of Avdiivka. Four militant artillery groups are active along the Pisky–Avdiivka line (26 cannon artillery units: mainly D-30 howitzers plus Msta-B howitzers; twenty-two 122 mm Gvozdika 2S1 and 150 mm Akatsiya 2S3 self-propelled guns deployed as several batteries; as well as six to eight Grad BM-21 122 mm MLRS systems constantly maneuvering along this sector of the front). Additionally, four militant armored vehicle groups have been reported on the front line (16 tanks operating across the entire sector, and 22-24 armored combat vehicles of various types, while the bulk of the heavy armaments has been slightly withdrawn to the rear and collected in several “armored vehicle parking lots” on the premises of local businesses, logistics centers, and warehouses). These armored vehicle groups are constantly firing on the ATO forces’ strongholds from camouflaged positions prepared in advance. The arrival of armored vehicles to their firing positions and [their] subsequent retreat after shelling is always carried out under cover of fire from the advanced enemy infantry groups using heavy machine guns, 82-mm and 120-mm mortars, AGS-17 grenade launders and ZU-23-2 auto-cannons. The crews and armored vehicles comprising the “advanced” enemy armored groups are continuously rotating. 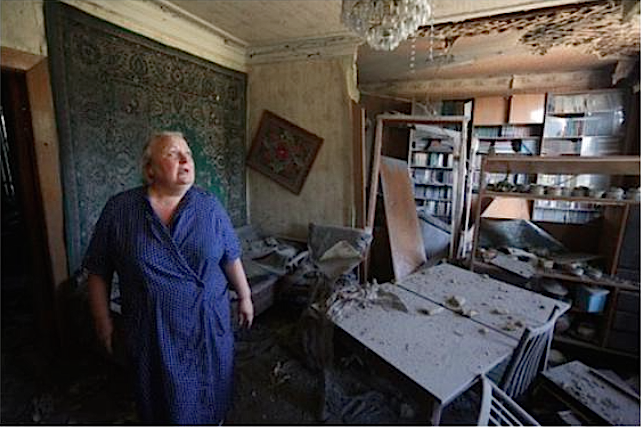 In Donetsk, a woman assesses the damages to her house from shelling on July 19, 2015. Photo: Aleksey Filippov, AFP. In the past 24 hours, militants in this sector repeatedly used cannon artillery, shooting mainly from the area of Spartak, from firing positions east of Panteleimonivka and in Donetsk – between Voronykhina and Yurjeva streets (near Shcheglovske cemetery). Over the past 24 hours, shelling was carried out by a total of four militant cannon artillery batteries and at least six self-propelled artillery guns. Fire strikes were made on advanced positions of Ukrainian troops as well as on objects and targets in the tactical midst of the ATO forces (up to 10 km inward from the separation line). The enemy is clearly trying to disrupt the ATO forces’ command and control systems in this sector. In the Luhanske, Troitske and Zaitseve areas of the Svitlodarsk bridgehead, the enemy opened fire several times, using small arms and grenade launchers (AGS-17 and SPG-9). The fire strikes were brief, intended more to harass our troop units than to engage any targets. The “war in the greenery” continues, with sabotage and reconnaissance missions, patrols and raids by “small groups” on both sides. In the past 24 hours, several skirmishes were observed between sabotage-reconnaissance and infantry units of both sides: between the settlements of Zolote and Orikhove (a militant sabotage-reconnaissance group stumbled upon the concealed combat security of the ATO forces); near Schastya (a firefight between patrols), and near Krymske (a militant group stealthily entered the “neutral strip,” but was spotted by Ukrainian troop look-outs, and was forced to retreat after a short skirmish involving grenade launchers). The “sniper war” is gaining momentum. Both sides make use of individual snipers as well as specially trained sniper groups. Snipers are the most actively used in the areas of Mar’inka, Pisky, Shumy-Kirovske, Chermalyk-Shyrokyne, Novotoshkivka-Krymske, Schastya and Stanytsia Luhanska. Militant artillery and mortar units are stepping up their activity south of Donetsk, near Hranitne and Starohnativka. The enemy is using both 82 mm and 120 mm mortars and cannon artillery. In the past 24 hours, shelling was carried out by one battery of Gvozdika 2S1 122 mm self-propelled guns (rotating with an Akatsiya 2S3 battery positioned west of Starobesheve) and one battery of 122 mm D-30 howitzers. Militants are transferring engineering and sapper equipment to the areas of Mospyne (Prydorozhnje), Oleksandrivka and Horbatenko, to clear minefield installations. Three IMR-2 (combat engineering vehicles) and one BAT-2 (armored track layer) units have been identified in the areas. Some of the terrorist tanks deployed south of Mospyne (Byryuky – Mikhaylivka – Svitle) are being equipped with detachable mine-clearing implements and practicing to traverse passageways through minefields. Municipal garbage truck in Donetsk repurposed by militants as mortar carrier. Source.